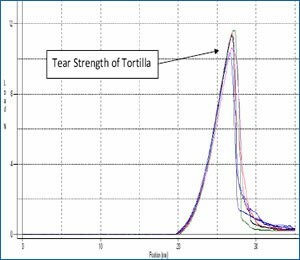 Producer of corn flour tortilla products needed a way to determine the texture and resistance to tear their products. To be considered a good tortilla, the product has to be flexible enough to roll up but strong enough to hold a typically hot filling without tearing. Current methods for testing are very subjective and unreliable. They wanted a way to put firm numbers to the properties of their products to replace current subjective measurements. Individual samples to be tested were prepared by cutting 6 square samples from the same tortilla to fit into the testing fixture. All testing was done at room temperature using the TMSâ€Pro Texture Analyzer. 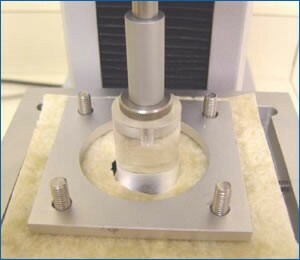 The samples were held in place using a ring clamp (Extensibility Fixture) and punctured through using a 1” inch cylinder probe. The test speed was set to 150mm/min and run to a distance of 35mm. This distance was far enough to have the probe puncture throught the sample. 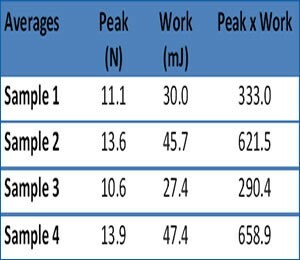 As a seasonal vegetable processor, understanding crop maturity and the accuracy of this measurement is key to staying ahead of crop and knowing when to make the move from value to premium product as harvest time constraints permit. The TU units provided by FTC give us the accuracy to work to much tighter tolerances, replacing older less accurate analogue equipment which in turn can affect final product grading and profitability. The units are well designed, very low maintenance and are backed up with a strong support service which will allow them to provide many years of accurate, reliable service.